Two different types of frictional absorbers were used. On the left you can see how rock wool was cut to fit into walls with funky shapes. Also note in the junction box near the floor you can see the white pull string used to bring signal cables in from the other room. On the right the framing is rectilinear so R19 insulation batts were easy to use. Notice the yellow straps on the near worker's head from the 95 rated dust mask to shield tiny airborne fiberglass particles, but the guy on the other side of the window frame breathes unprotected. Not Good! Except for doors, windows and some diffusors the walls were absorptive so a lot of batts were needed. 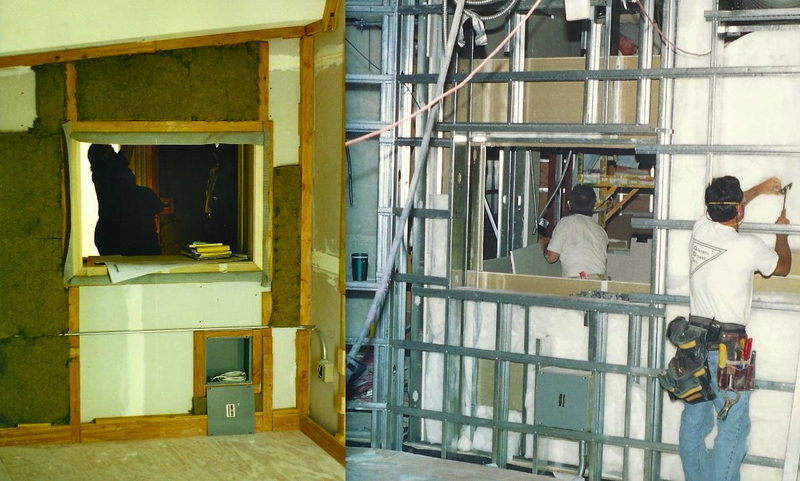 Here we see the progress from rock wool to finished fabric wall. The brown wooden framing supports the white snap track used to fasten the final layer. But first the white quilting fabric covers the rock wool. This makes the outer fabric softer to the touch and more consistent in color with cloth covered R19. To the left we see the final wall fabric. We also see the RPG Skyline diffusors installed overhead in this control room. The listening position is always the loudest location in the room. But if all of the surfaces are absorptive, then sound can be lost too rapidly and people in the back of the room have a more difficult time hearing. Diffusion redistributes acoustical energy, spreading it out and preventing specular reflection. This allows folks at the client desk to hear well without deafening the people closer to the speakers. 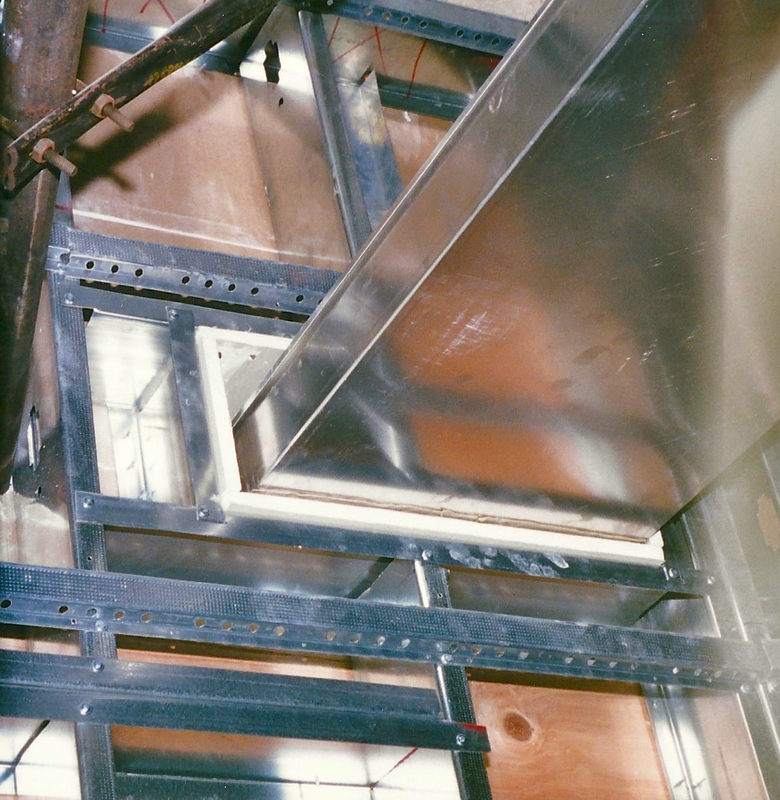 This cable tray ran above the false ceiling to connect the control rooms. The total run was nearly 80′. 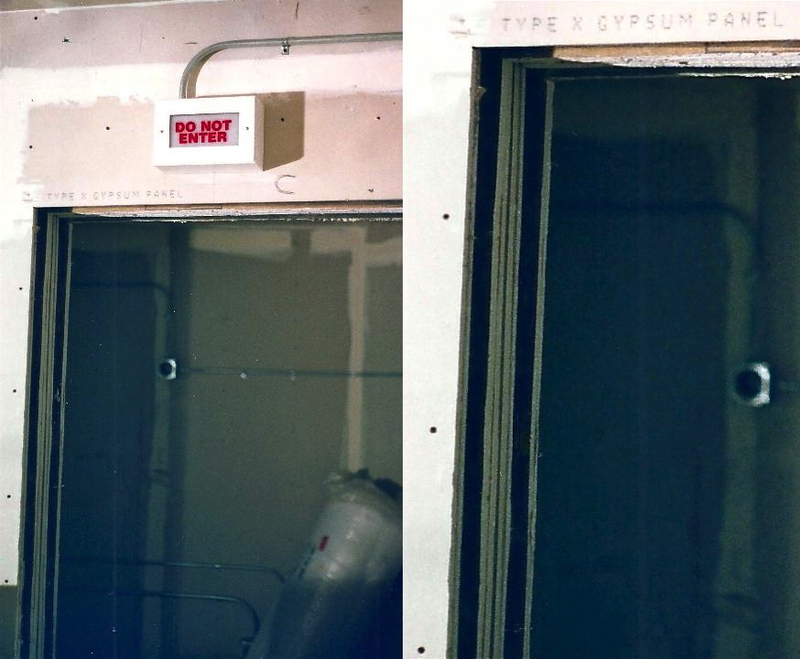 Left: the “In Use” light has been installed above the doorway. 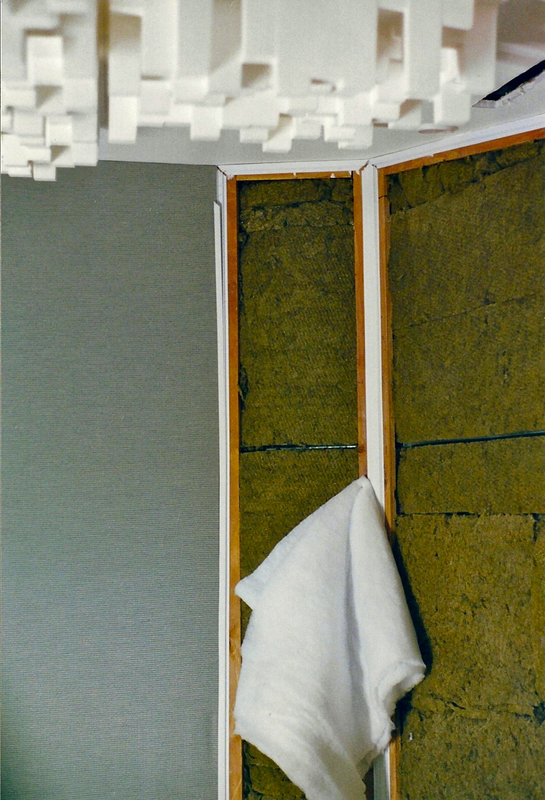 Right: a closer look at this transition between rooms reveals the many layers of drywall used to help reduce sound transmission. 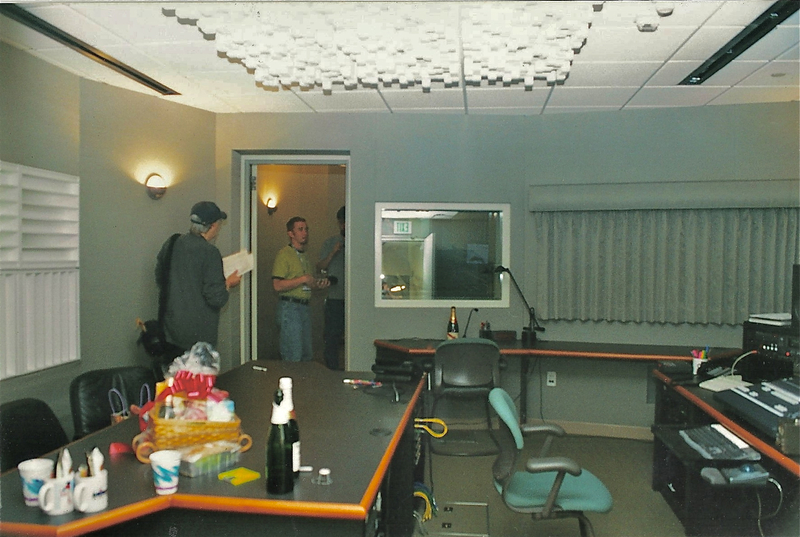 After all of the construction was done, but before we recorded anything in the new studio, we had a little party. The late, great Wayne Allwine (left) visits with Brian Kahanek and yours truly. 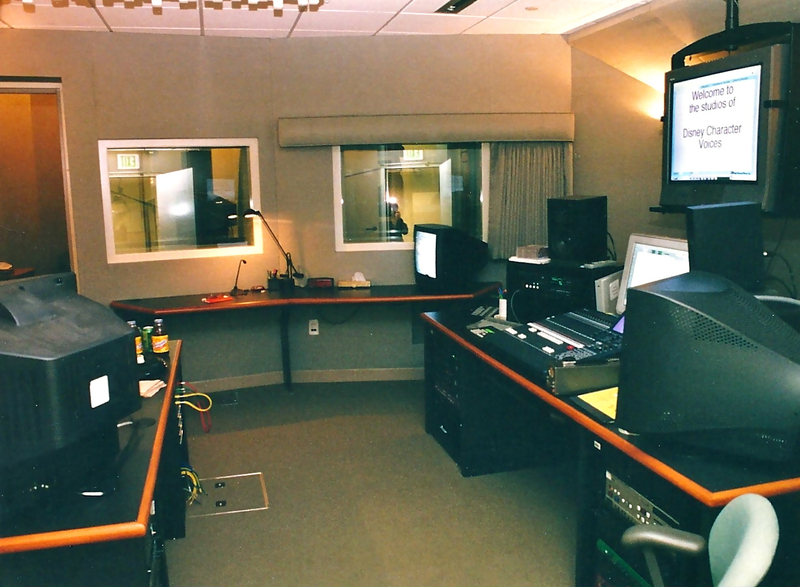 I forgot how few flat panel video monitors were used originally when the studio began operation. Eventually all but one of those CRTs were replaced. The counter top on the left is the client desk. Straight ahead we see the director's desk with talkback mic and clear sight lines into both iso booths. The engineer's position is to the right. You can see the yellow patch cables in the bays behind where the engineer would sit and a sub-floor access panel below.